We have a very large family, seven kids and two adults. We eat a plant-based, vegan diet. 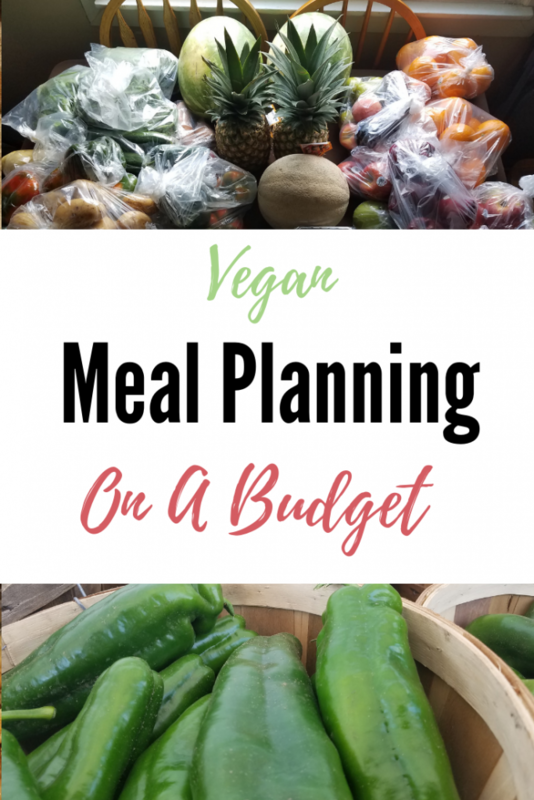 With that said, meal planning is a MUST in this house in order to stay within our budget! 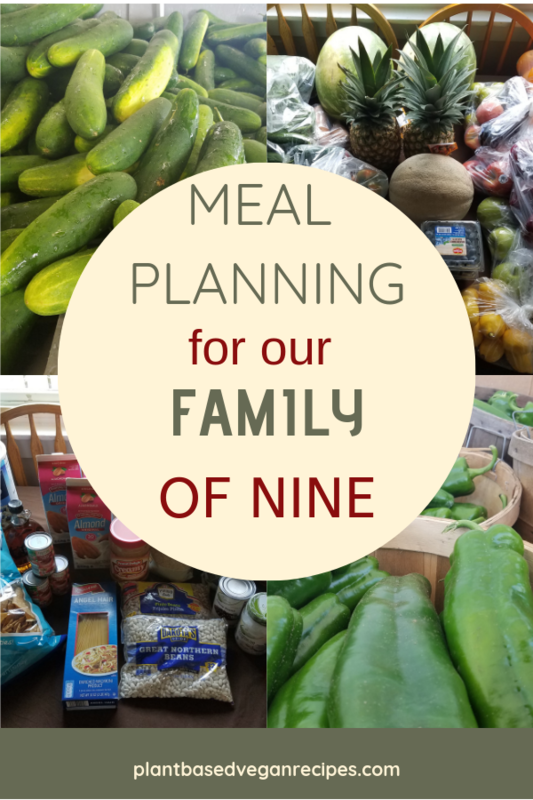 Today we will show you how we meal plan to feed our family of nine for under $200 a week. Meal planning is very simple. It is basically creating a menu for the week. Open up a text document on your computer or write it down on a piece of paper. This is what ours look like. As you can see, we plan out each meal for every day of the week. We always repeat a few meals to simplify things. That way we can buy in bulk to save money, and also cook twice as much at once so it is less work the next day. There are a few items not on this list because we already have it. We are making our own pasta sauce and tortillas from scratch as well. I know this isn’t obtainable for everybody, but if you can squeeze in an extra hour somewhere to prepare a few ingredients from scratch, it can save you a lot of money, and help you to eat healthier. Store-bought pasta sauce is OK in a pinch, but it isn’t fresh ingredients so we use that as a last resort. We also compare prices between Aldi, Meijer, and Kroger. We don’t always shop at Aldi, but sometimes it is the cheapest route. Since mostly everything we need is pretty basic pantry items, we went to Aldi because it is the cheapest. I usually look up the weekly ads for each store and see what is on sale. Another tool we use to save money is by using the Ibotta app. Ibotta is awesome because we earn cash back from some of our grocery purchases. I always check Ibotta before I choose which store we are shopping at because if I can find a rebate for a product I need, it will end up being cheaper than Aldi most of the time. If you sign up for Ibotta using my referral code dnebkns you will get a $10 welcome bonus! The next thing we do is head to the market for our produce! Fruits and veggies at the grocery store are outrageously priced, and never seem to last very long. Around here we have a few options for affordable, local produce. Blocks is our cheapest option, but they are only open for a few months out of the year so the rest of the time we go to Randazzos. Both markets are extremely cheap. We know most of our readers are not local, so these markets won’t be an option for you. We recommend that you google search for markets in your area. Most cities have farmers markets available. If there aren’t any local options for you, your best bet is to shop sales and freeze what you can. You can freeze fruit for smoothies, and vegetables for your soups. That way you can stock up during the sale, and keep it for later. This would also make Ibotta even more useful to you! Not pictured is the giant case of bananas, a case of strawberries, and the case of tomatoes. Next, we went to Aldi and bought our beans, rice, and other pantry items we needed for the week. We try to by organic when possible, but it really depends on the cost. Our grand total was $54.96 at Aldi. We have fruit bins set out on a shelf for the kids. They each get 2 pieces of fruit each day. We used to just let them grab as much fruit as they want, but it didn’t work well for us. Some kids were binge eating fruit all day and not wanting to eat their dinner. Others weren’t getting any at all because someone else ate everything up. So we started portioning it out to 2-3 pieces of fruit per kid, per day. They each get their own separate bin and they are free to grab as much as they want, but they know that’s all they get for the week. This works out much better for us! Our grand total was $136! This covers all 3 meals for 7 days, plus snacks, for 9 people. 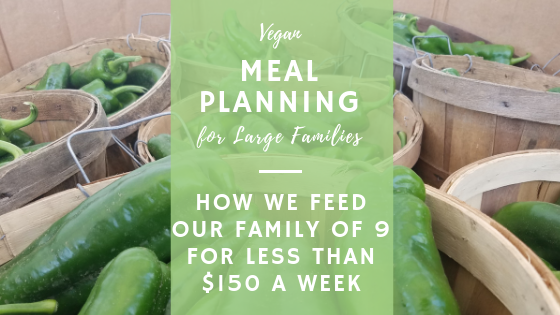 Before we started eating a plant-based vegan diet, we could easily spend $200-300 per week. Just because we eat healthily, doesn’t mean we don’t ever have treats. We occasionally treat ourselves to some Ben and Jerry’s non-dairy ice cream or a Starbucks soy Frappuccino. The point of a plant-based diet is to base it off of plant foods. It does not mean you can’t have treats every once in a while! 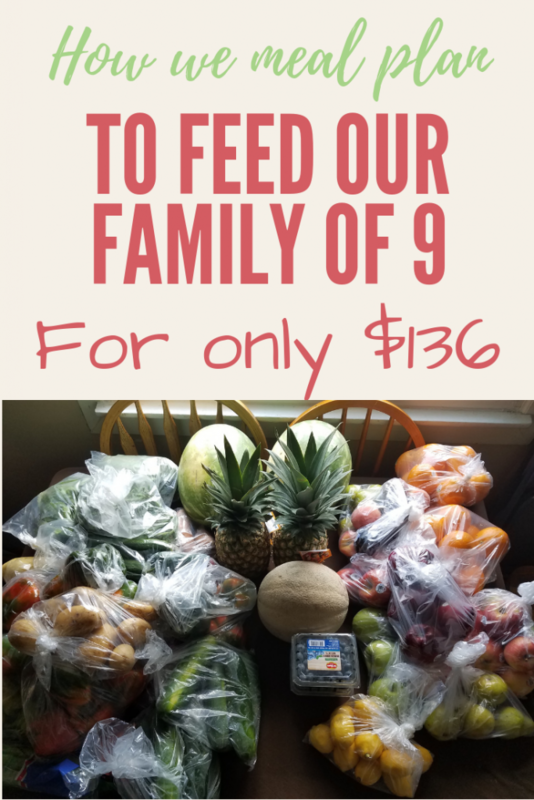 We hope you enjoyed this post and hopefully learned a few tips on how to feed your family on a budget. Drop a comment below and tell us your secrets to saving money at the grocery store! Check back every Monday for our weekly shopping trip posts!